Greetings once again and thanks for taking the time to visit. 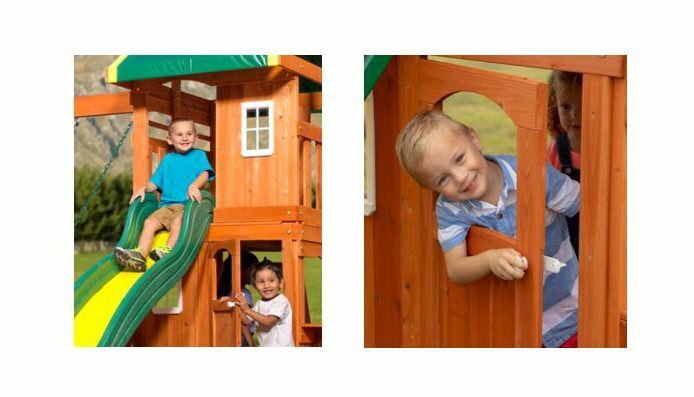 Are you thinking of buying a Backyard Discovery Oakmont Cedar Wooden Swing Set in the coming weeks or even days? If so, then make sure to check out this very important review which will outline all the main features, pros and cons that you need to be aware of before you decide to buy. This review will also outline several other images to give you a better understanding of what it has to offer plus a series of FAQ that will be of interest to you that have come up across the industry. In addition, we know that price will be a very important factor for you so please make sure to check out the price comparison options provided below underneath this review that may help save you some money also. Q. 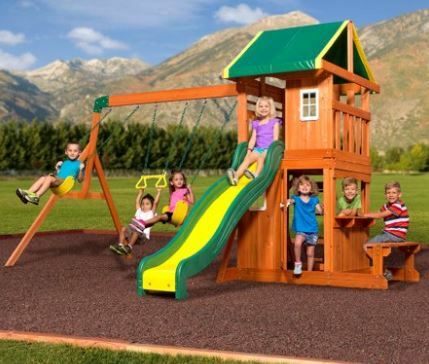 How many kids can play on this at the same time? Q. What size area is needed for the safety zone? Q. How long does assembly generally take? Q. 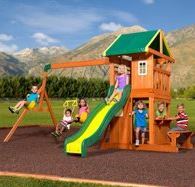 What age group is this Swing set suitable for? Q, What is the size of the shipping box? Q, Does this swing set include Anchors? Q. Does it need to be maintained? Q. 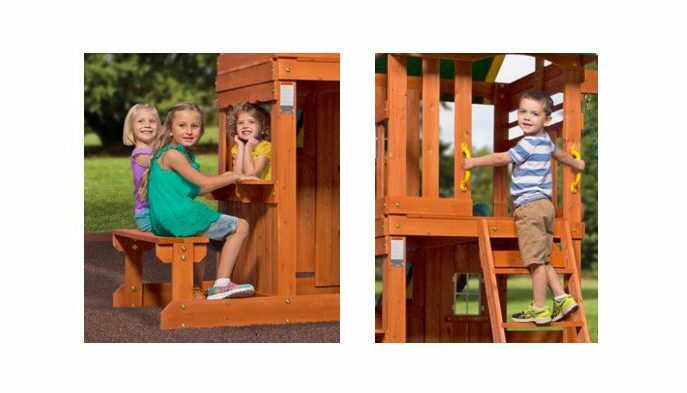 Can it be assembled by one person? The overall size dimensions are 14'W by 11'3"D by 8'7"H and the frame is angled for added stability on the side. One of the main attractions is the colourful raised fort which has the front wall with white trimmed window. The second attraction is the second fort underneath which has a front wall, window and a real door. Overall great value and features for the level of money that you have to pay. 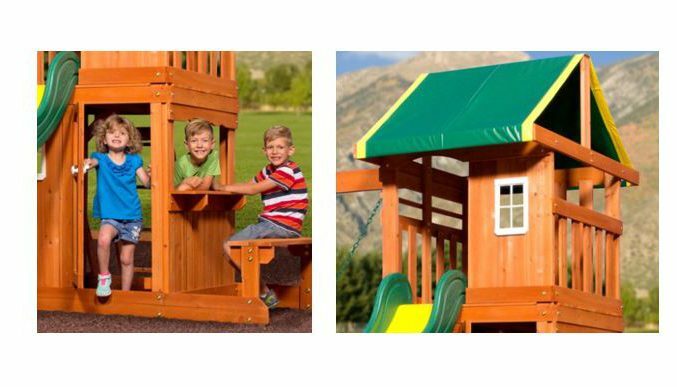 Doesn’t include a passenger swing, glider, tire swing, wooden roof, or a sandbox that many others offer. A lot smaller than it looks but adequate for beginners, you may need to upgrade as your kids grow bigger which will be an added expense. Wood is too soft for some and it requires further sealants, staining, maintenance on an ongoing basis. 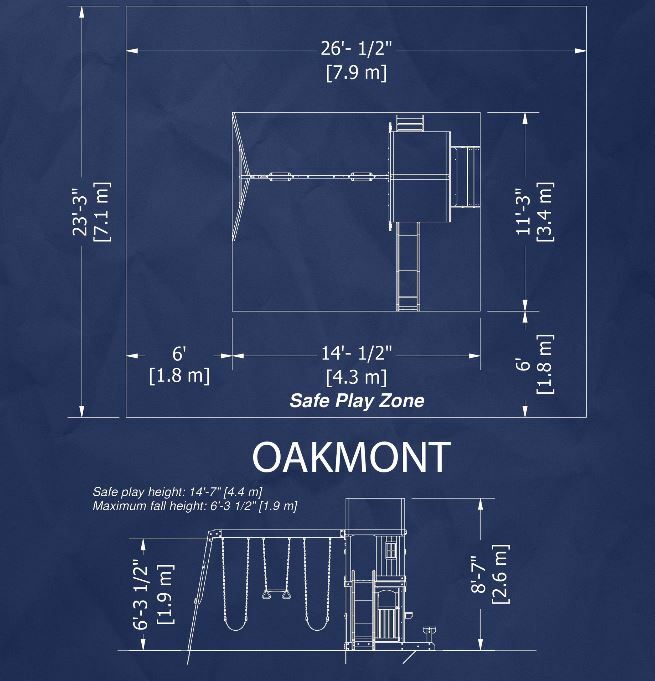 Upper deck dimensions is 40" by 40"
Have you or your kids any personal experience with the Backyard Discovery Oakmont Swing Set in the past? If so, then please share your thoughts and feedback with the wider community by leaving a comment in the comment section below – So that they can learn also!!! 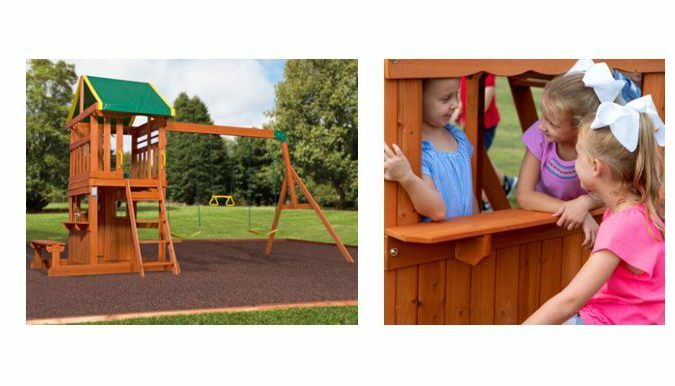 Posted in Swing Set Reviews and tagged Backyard Discovery Oakmont, Backyard Discovery Oakmont Cedar Playset, Backyard Discovery Oakmont Cedar Swing Set, Backyard Discovery Oakmont Cedar Swing Set reviews, Backyard Discovery Oakmont reviews, Backyard Discovery Oakmont swing Set. 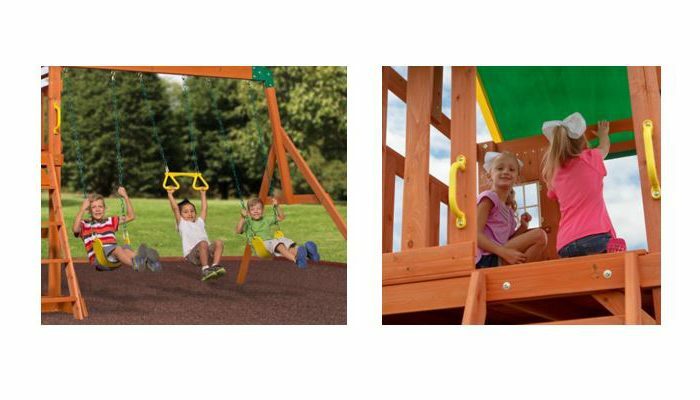 Pretty neat review on the Oakmont swing set….very thorough review and nice images. We hope to get one in a few weeks time for a special birthday gift. Thanks for sharing the details from your review as it has prepared us well in advance…..